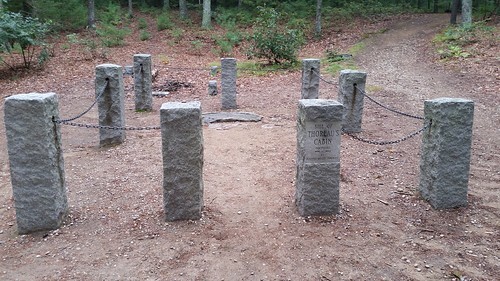 The site where Henry David Thoreau's cabin was during his experience written about in On Walden Pond. I try to get out to Walden Pond at least once a year. It's a nice serene and green space that is a hallmark of Americana (and American literature). In particular, I like to visit the site where Thoreau's cabin stood and see this little space. I always find it curious that they used stone pillars and chains to mark the perimeter of it and allow you to step inside to get a sense of the place. I appreciate that they haven't re-created the cabin here on this spot (though you can see a facsimile near the parking lot to the park) and that you see just what nature has left of his efforts, which I think is its own postscript to On Walden Pond.